Why do California farmers vote Republican? Older generations in urban California for years have attributed the reasoning to racial demographics, citing an old cowboy culture from old families of California ranchers and Oklahoma migrants emerging from the Dust Bowl of 1930s. Many point to the last vestiges of California’s old racially segregated culture from the 1920’s. However this view to the California agrarian worker is a far cry from today’s modern truth; many ranchers are now ethnically diverse and they rely upon the same water systems for support that the ‘Okie’ counterparts of old also relied upon. California farmers today struggle with an unresponsive and malevolent state congress, hiding behind the banners of Democratic values and environmentalism while secretly supporting a large structure of illegal drug cartel marihuana growing operations that occupy vast territories of land throughout the Northern and Western mountain ranges and most importantly the Sierra Nevada’s. An Up-North trip on the Interstate 5 freeway out of Los Angeles will take you into the Central Valley, one of the largest agricultural bread baskets of the United States and the world. 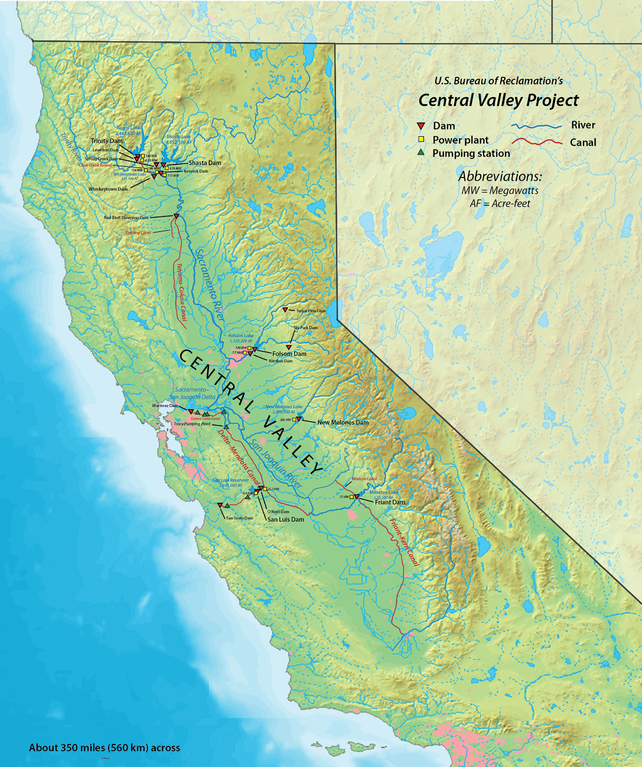 The Central Valley also exists as the center of the California Water Crisis. The Crisis itself has actually been in play for over a decade, but kept somewhat under the radar by state politicians who shoulder much of the responsibility for the Central Valley’s current Dust Bowl. After an hour, once a person passes the oil fields and the industrial farm operations, they will begin to see large signs on fallow farms that very bluntly state “Congress Created Dust Bowl”. A curious individual can make a road side stop at some of the information booths sat up by the many farmers to inquire what is going on. Upon speaking with the farmers it is easy to gather why they are so staunchly conservative. 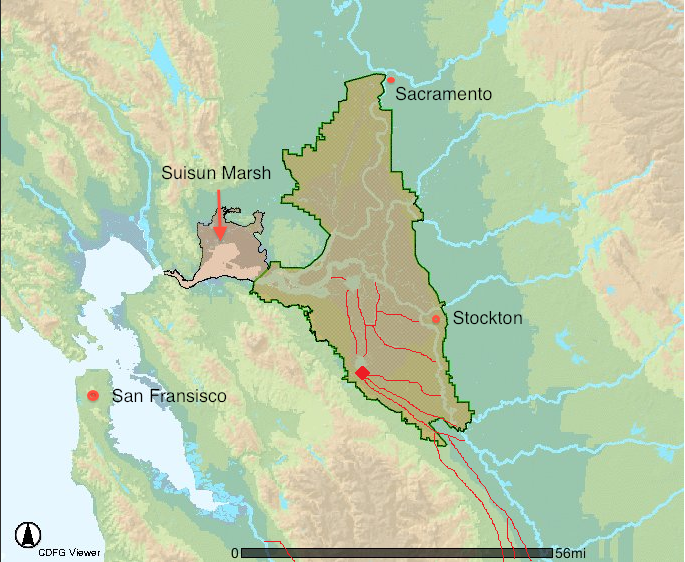 Their crops are dying from lack of water while the demand for food production is actually increasing, and they feel neglected and abused in large part by the Sacramento government (which they view as liberal) and by the federal representatives (also liberals) from large urban areas that are disconnected from the reality of agricultural needs. This abuse has had real results that have become the center of media attention in California this year, as waterless fallow fields are seen throughout the state. The liberal association by the farmers toward their state representatives naturally works its way up the chain of emotional projection beginning with Willie Brown, the former Speaker of the California Assembly and former Mayor of San Francisco [implied by many in marijuana communities to be one of their most powerful political supporters] to Senators Barbara Boxer and Diane Feinstein, which they allege has supported Governor Jerry Brown in creating an artificial shortage of water to the central valley for political not environmental reasons. This anger with the California Democratic establishment for not being pro-farmer and pro-laborer has transformed into the misguided radical zeitgeist that is the right wing Tea Party, which has convinced many of these farmers that the state politicians have taken their orders from the Nancy Pelosi and Democratic National Committee and that she has ultimately taken her guidance from President Barack Obama. This has led to continual support in these communities for more and more radical right wing political candidates as the election years progress. The culmination of this right wing radicalism, partially led by the infiltration of Ron Paul’s Southern Conservative Campaign For Liberty organization into the state, has been successful at transforming farmers let alone medical marihuana growers into right wing advocates of economic austerity, deregulation and deflation. The effects of this can be witnessed in the recent debut of the neo-conservative six-state initiative that will appear on Californian’s ballots in the election season. This effort is being led by staunch Bush ally, Tim Draper of the Draper banking families, with the intention of dividing up California into rich and poor. It is also a political gamble to create more Republican red states even though the initiative is federally unconstitutional. Draper claims California is ungovernable but his initiative disguises his true intentions, which is to help northern and eastern cartel growers exist under a subservient micro state government in exchange for transforming San Francisco and Silicon Valley into its own plutocratic financially deregulated state that resembles the privileged City of London. The initiative leaves the other states as client states for these primary states. So why are the California State Democrats driving our citizens towards these misguided and malevolent right wing ideas and characters? The simple answer is greed and a desire for a continued cut of the states marihuana profits in exchange for allowing cartel entities to grow marihuana with impunity on state lands. The substantiation of this allegation can be found with just a simple examination of California’s watershed in comparison to the location of the major marihuana growing centers in California. 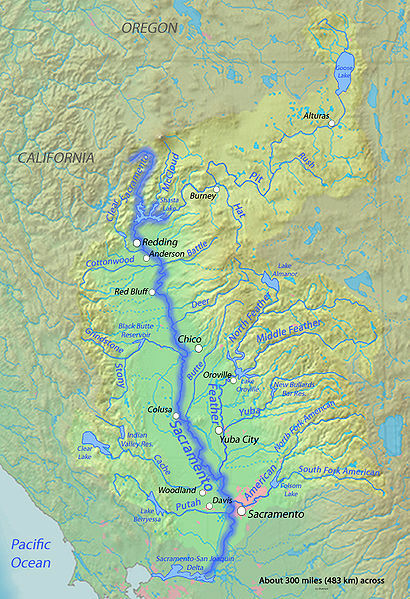 As we can see by the maps the rivers and the subsequent water supply are distributed from the river basin system via a complex system of irrigation dams, power stations, pumping stations and canals that are located at the base of the Shasta Mountains, the Mendocino Range and the entire range of the Western Sierra Nevadas. 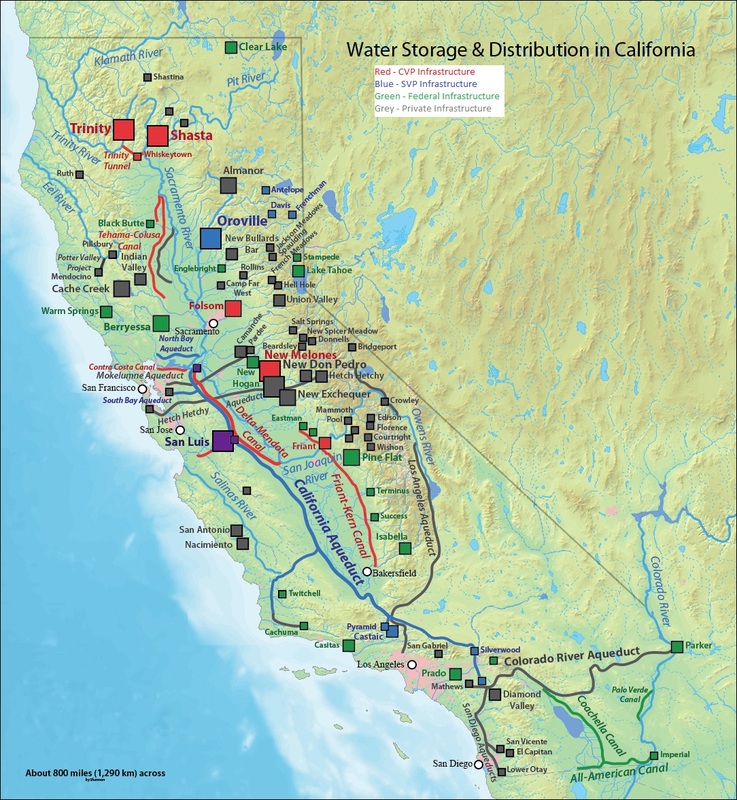 As also noted on the map, critical infrastructure to the Southern California water supply is supported by the SWP as it interchanges the Los Angeles Aqueduct, the Colorado River Aqueduct, California Aqueduct and the Friant-Kern Water Canal. 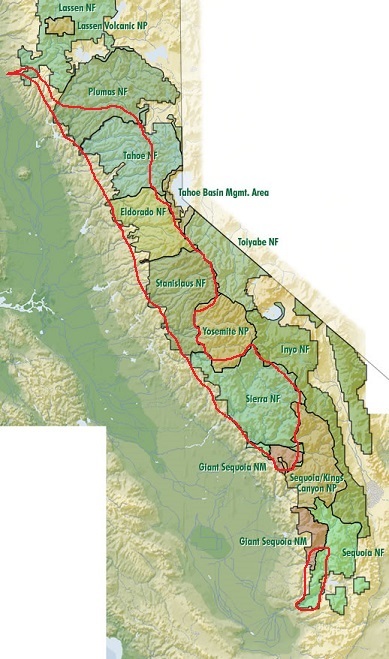 One cannot help but take note of the plethora of private water companies that exist in the major marihuana growing regions of California, these private institutions must do really well financially in supplying the water needs of the various cartel guerrilla grows that exist throughout the Mendocino, El Dorado, Stanislaus, Sierra and Sequoia National Forests. 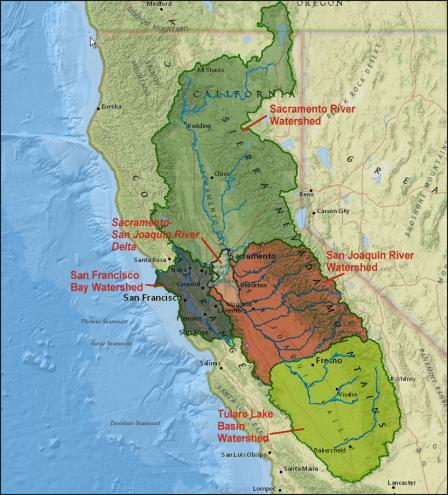 NBC Bay Area News was quoted as saying “California’s river and reservoirs, including the Sacramento and San Joaquin rivers, are below their record lows, according to the state’s water managers. Manual and electronic readings record the snowpack’s statewide water content at about 20 percent of normal average for this time of year. U.S. Sen. Dianne Feinstein, Rep. Jim Costa, D-Fresno and several state lawmakers began urging [Gov] Brown last month to declare a drought emergency. Brown appointed a committee to review conditions on the ground.” The irony remains that most of Central Valley farmers blame these same politicians (Feinstein, Costa, Pelosi and Boxer primarily) for fomenting the crisis by supporting several environmental protection projects that reduced the water supply. One of these hotly contested but media forgotten projects was to preserve an endangered fish species called the Delta Smelt; many Californians have forgotten that the biologists involved in this decision to protect the Smelt were accused of fraud by several farming entities as well as state and federal wildlife agencies. An independent panel narrowly vindicated the biologists of scientific wrongdoing and fabrication of evidence despite the fact that the Judge involved in the case “… lambasted their testimony on an endangered fish as “false” and “outrageous.”. This courtroom incident was covered by many major news outlets including the LA Times but continued to fly under the political radar in California. E&E Publishing cited that “U.S. District Judge Oliver Wanger stopped short of accusing the employees of scientific misconduct in a September ruling, which dealt with the Fish and Wildlife Service’s justification for water pumping cutbacks to the Sacramento-San Joaquin Delta. He instead called Jennifer Norris of the Fish and Wildlife Service a “zealot” and Frederick Feyrer of the Bureau of Reclamation “untrustworthy as a witness”. But an independent panel of scientists — convened by Resolve, a nonpartisan “dispute resolutions” organization — found that neither Norris nor Feyrer violated standard scientific practice. In a recent report obtained by Greenwire, the panel asserts that no further action is needed on the issue. But they also criticize Norris and Feyrer for testimony that they said was sometimes unclear. “We suspect that this failure to provide clear and convincing explanation, more than any other issue, may have led Judge Wanger to reach his conclusions alleging lack of candor and integrity,” they wrote. The Banks Pumping Plant located near the Clifton Court Forebay and one of the primary connectors of water supply from the Sacramento River to the San Joaquin River Basin, and was politically targeted for water supply reductions so tributaries would have less water demand thus allowing the fish to rehabitate the delta. What was not indicated was how the under-allocation of the watershed would allow marihuana growers at the source point of these tributaries to use more water for their illegal cartel operations. 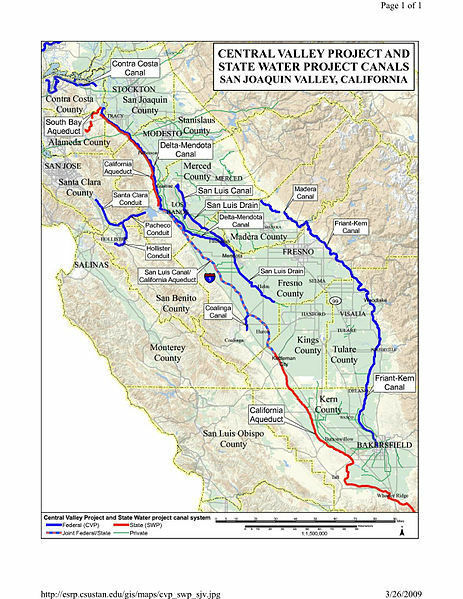 By simple view of this map we can see that this habitat encompasses the pathway of a lot of major tributaries to the Sacramento-San Joaquin River Basin; an understanding of simple hydro-engineering and common sense will tell you that any farmer upstream of this reduction, marihuana grower or not, will no doubt receive major benefits from not having to meet the demands of the Central Valley and southern urban centers. So who is upstream of this reduction? Who owns the California Congress outside of Silicon Valley plutocrats and Hollywood moguls? Well everyone in California knows its the kings of California’s largest cash crop, the major marihuana growers and the cartels. Marihuana in California is an untaxed, unregulated, big business that is cash only and maintains a large supply of liquidity that can be used within the state to fulfill their political purposes. It was of no surprise to anyone within the Medical Marihuana community that this year’s drought and lack of snow-pack would no longer supply Shasta and Sierra marihuana growers with the water supplies that were required to meet the ever increasing marihuana demand. It was also of no surprise that Governor Jerry Brown would announce ’emergency measures’ to support these grows. It is no secret that many Cartels, not limited to Mexico but also including Asian based and Eastern European based drug organizations have taken root within the State of California to grow marihuana. Many within the Cannabis Culture and Medical Marihuana communities are fully aware that the Western and Eastern Sierras serve as the bastion for cartel growing operations within California and that these operations serve the demand for high quality bud in illegal interstate markets. A simply geographic comparison will make the answer quite apparent; looking at the following maps we see the tributary systems that make up the watershed of the SVP and CVP. Is it merely by chance that California Federal and State congressional representatives have punished the farming community in favor of supporting the politically and financially lucrative guerrilla growers and drug cartels? Is it by chance that marihuana growers are the biggest beneficiaries of this central valley water reduction and that their operations lie in the regions that stand to benefit from the water reallocation proposed by major California political figures like Governor Jerry Brown, Senator Diane Feinstein, Senator Barbara Boxer, Representative Jim Costa, Representative Doug La Malfa and many other so-called ‘liberals’ and ‘libertarians’ within the California state establishment? Is it possible that these so called ‘liberals’ have used environmental protection as a pretext to throw an ecological and financial bone to the demands of the non-medical marihuana market? In the modern state of California, bribery and corruption seem to be the order of the day, as revealed by the recent turn of events surrounding the corruption case of the Calderon brothers of Southern California. 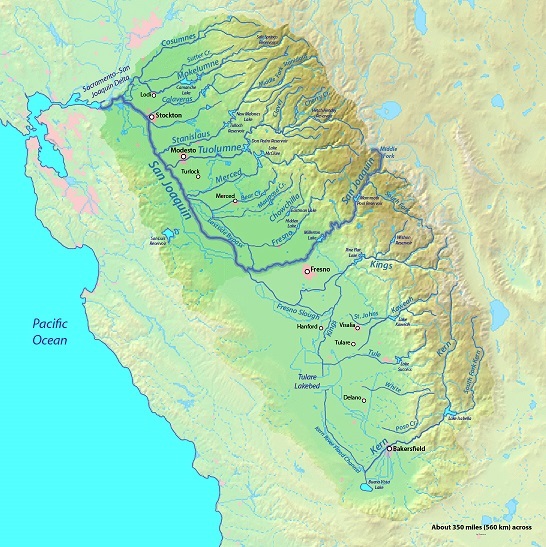 This entire incident also brings the agenda of the notorious ‘Peripheral Canal’ to the forefront which has been spearheaded by many of the same politicians; the irony of the canal is that it further supports marihuana by allowing growing sources to retain more freshwater by devastating Sacramento farmers through the encouragement of salt water into the delta. What better way to control more supply than to eliminate your resource competitor outright? Given all of these circumstances, the ultimate question with the states response to this crisis remains: Is Jerry Brown really out to protect the farmers and our water or is he out to protect his marihuana sponsored pocket book? Perhaps the answer for the Central Valley farmers is to negotiate their own water rights in a free market capacity. Cadiz, Inc. purchased 34,000 acres in the Mojave Desert (above an aquifer) that they anticipate selling to desperate SoCal communities see VIDEO: http://bit.ly/1qN2Sh6. They estimate that 16.4 billion gallons of water will be trucked from the desert to supply the demand. I believe the central valley farmers should be doing the same thing instead of waiting for politicians to seal their fate (for whatever reason). Hey There. I found your blog thee usee of msn. This is an extremely well written article. I will make sure to bookmark iit andd come back to learn more of your useful info.